Hereford United manager Pete Beadle has thanked the youth team for all their hard work and wished them well in the future. His words came after the youngsters won the HFA Giantkillers Cup last night at Edgar Street. "Would like to say a massive thank you to an unbelievable group of young men. From day one not a complaint and a fantastic attitude," said Beadle. "Given me some wonderful memories, we've laughed and cried together, and would like to wish them all good luck for their future careers. "Life is about cherishing the past, facing the present, and moving ahead towards new milestones." Sam Smith made a surprise appearance for the U's in the play-off first leg match with Halifax tonight. The forward started the 1-0 loss to the Shaymen at The Shay, with top scorer Lee Gregory netting a late penalty for the hosts. Smith, who started only 11 games for the U's in his first season, last played for them just over a year ago. Hereford United’s successful U18’s rounded of their season with a 3-2 victory against their Pegasus opponents at Edgar Street this evening in the Giantkillers Cup. A Ben Miller brace gave the young Bulls a two goal interval lead before Pegasus fought back after half time. Goals from Josh Rogers and Joel Beaston levelled the match but Max Kontic-Coveney settled to match with a deft flick past the Peggy keeper. A crowd of several hundred watched a very competitive and entertaining game that was a credit to both sides. Meanwhile a further 50 or so turned up for the monthly quiz that ran in Radford’s with this month’s winners being the Pointless Chasers with an impressive 94 out of 105. Hereford United Board of Directors have released the following statement regarding potential investment. We have chosen to avoid making statements in the past few weeks as we all directed our support to the players and the caretaker management team of Peter Beadle and Steve Jenkins. What a magnificent result they achieved on Saturday. A feat that ranks, for differing reasons, alongside the Brentford result, the victory at the Walkers Stadium and the Newcastle/West Ham results. Crucially, the most telling success of the past month however has been how quickly Pete and Steve assessed the situation and identified those that were up for the fight and those that were not. Close on 800 travelling supporters was another reason why we came through. You were fantastic support to the players and carried them through those harrowing final minutes although the emotional rollercoaster that went with it was draining for us all. We salute all of you for a great job well done. There has also been quite a lot of work happening off the pitch, including ongoing negotiations with possible investors and the equally important coordination of fundraising ideas as witnessed at the first meeting last week. Both are essential to ensure the future of the football club. A local fundraising/commercial committee with a realistic annual target each season will be a real boost to the football club’s finances. Thank you to those that have attended the first two meetings and for all the ideas that have been forthcoming. The Board of Directors met two weeks ago with the committees of HUISA and HUST to air some facts about the level of funding required to reach the summer and to identify ‘building block’ targets to help achieve that funding. The meeting was designed to be about all groups working together for the football club and at the meeting HUISA offered to fund the team coach to Tamworth and HUST followed suit by offering to fund the coach to Aldershot. Two excellent, and much appreciated, gestures as examples of working together. HUISA have paid over their donation of £600. HUST however seem to have altered their position since our meeting held last Summer when the stated line was that they had no intention of taking over the club, nor did they know if they wanted a place on the board. As directors we have always stated that a united support base with a strong voice is a key ingredient to the football club. It has been disappointing therefore to read in the local press and on unofficial websites that the Supporters Trust continues to wish to operate separately to other Supporters bodies and has even been quoted as suggesting that the club’s Board of directors would be “willing to leave the club and write off their loans for £1 in exchange for guaranteed investment.” (Hereford Times 24th April 2014). It seems that they have suggested that guaranteed investment to be £300,000. For clarity, the board of directors would like to state that before receiving an email from the Chairman of HUST on Tuesday 29th April there has been no dialogue with the Supporters Trust whatsoever on this subject. The Board of directors have replied to invite the HUST to a meeting to present their offer but has also stated in the reply that the Board is still in discussions with interested parties and, though not finalised nor signed, the detail under discussion offers the potential of a significantly better outcome for the current board than the Trust’s offer. The discussions are at quite an advanced stage including dialogue with the local Council over the property development opportunities at Edgar Street. Following the revision of the ground leases and the Council’s clear support for the club to attain funds through the sale of land at each end of the ground these discussions must continue until exhausted. The leases represent an asset with a value of approx. £1M with a potential inflow of cash to the football club of an estimated £1M-£1.5M over the coming years from the sale of each end, the majority of which will be used to re-shape the terracing as described previously, these discussions, in the opinion of the Board, currently represent the best financial deal for the football club. The board of directors look forward to meeting with the HUST committee members in the near future to discuss their offer. As Club directors we do intend to pursue our preference that the football club continues into the future as Hereford United (1939) Limited, with our goal being to once again reach Football League status, an aim shared we believe by the vast majority of the club’s supporters. Both of the external investors share that ambition. Thank you again for your support this season. Saturday’s performance and result gives us all fresh hope for the future provided we stay United. Telford seem set to lose keeper Ryan Young after he decided to relocate to the Isle of Wight. The 34 year old has spent seven years with the Bucks and will speak to boss Liam Watson before making a final decision. Aldershot's pitch is being sold off for charity, with the replacement coming from Chelsea's Stamford Bridge home. The Rec is used by the Premier League side for their youth fixtures. Former Bull Joe Anyinsah has been released by Wrexham. Veteran defender Dave Artell has also been let go by manager Kevin Wilkin, who blamed a limited budget on both decisions. Eight further players have been offered new deals with midfielder Kevin Thornton invited back for pre-season training. Nine more players are still to have their futures discussed. Barnet have taken up contract options on David Stephens and Luisma Villa, and handed Andy Yiadom a new deal. They have transfer listed winger Keanu Marsh-Brown in the hope of a good transfer fee to boost their budget, and expect top scorer Jake Hyde to turn down a new deal in favour of League football. Fellow striker Jamal Lowe has also been transfer listed, while four more players including striker Harry Crawford have been released. Kidderminster have handed new one year deals to Callum Gittings and Jack Byrne. The pair have both been with the club for four years, making 27 and 23 starts this season respectively. A reformed Eastwood side will start again at the Notts Senior League at a minimum. The club, revived from the ashes of Eastwood Town after their mid-season collapse, are yet to secure their former Coronation Park home to play games. Alfreton chairman Wayne Bradley has put the club up for sale, the local press are reporting. With the Reds having achieved their highest ever league placing this season, Bradley is set to end a 12 year spell at the helm of the club. He took over the side in the Northern Counties East League in 2002, winning four promotions to get to the Conference. Bradley told the press that falling attendances were to blame: “We have got to a point where they won’t pay £18, they won’t pay £15 and affordability is something that is definitely questioned. “We have got a support level that is going the wrong way and an income level that is following suit." Bulls chairman David Keyte is continuing investment talks this week. Director Bob Pritchard told last night's Fundraising meeting that Keyte would meet two potential groups today and tomorrow. The Supporters Trust have also confirmed that they have received a response to their offer, with a meeting between HUST and the club's board hoped to take place early next week. The club are looking for volunteers to rattle buckets at Saturday's match between Swansea and Southampton at the Liberty Stadium. The Swans have allowed up to ten people from the Bulls to fundraise at the game, with the Premier League side also giving the club ten free tickets for the volunteers. Anyone wishing to help can email Lee on club@herefordunited.co.uk to register their interest. This evening is the last time Hereford United supporters will be able to watch the current under 18's team in action. Recently a decision to axe the under 18 squad was taken by the board as, in their opinion, the club can not afford it. That's despite perhaps the best season the under 18's have ever had. In particular their run in the FA Youth Cup, which ended when they were defeated by Manchester City's under 18's, was a joy to watch. The under 18's have been managed by Pete Beadle and Steve Jenkins who recently took over the senior side from Martin Foyle and Andy Porter. Beadle brought three of the youngsters into the senior squad, Jarrod Bowen, Billy Murphy and Cory Williams and each has played a part in the 'Great Escape'. Tonight the under 18's will be at Edgar Street for the final of the HFA Giantkillers Cup. They will be up against Pegasus Juniors. The youngsters deserve plenty of support tonight. Admission is just £3 for adults and £2 for concessions. Entrance through Addisons. HUST, the Hereford United Supporters Trust, want to know the level of debt at the football club before committing themselves to investing in the club. The trust has had pledges of well over £100K and have written to chairman David Keyte about looking at the books. "We could be looking at doing a deal inside the next four weeks," vice chairman Martin Watson told BBC Hereford & Worcester. "The decision is entirely down to the board. The indication that I've had is that they're open to discussion. "It sounds like we're going to get another winding-up order. "But the big thing now is working out, not so much getting past the next six weeks, but how we deal with the upcoming debts after the next six weeks. "It's how we trade our way through the situation so the next thing to do is to get a look at the books, work out what figures are needed when and see how we progress up because, at the end of the day, even if we got through the next six weeks, we'd still be hitting crisis after crisis. Southport have announced that manager John Coleman has left the club. 'John Coleman has made it clear that at his age of 52 he feels he should be managing in the Football League, and by his short management spell at Southport he has put himself back in the shop window. Everyone at Southport wishes him good luck as he pursues his managerial career that has seen him manage both Accrington Stanley and Rochdale in the Football League. Coleman's assistant Jimmy Bell has also left the club. The activity at Edgar Street on the pitch has drawn to a climax and indeed the fat lady has finally sung! Whilst the footballing activity is over there is much to be resolved off the pitch. A meeting of the Hereford United Supporters Trust (HUST) Working Group was held last night with a 3 issue agenda. First, Vice Chairman Martin Watson updated the meeting on the request for pledges and commented on the wide ranging support the Trust had received since the request for pledges in support for a bid was launched last week. An enthusiastic meeting unanimously supported the proposal to now approach the football club formally with a view to taking over responsibility for the running of the club. This will be done today with a request for a response by the end of the week. On Trust matters it was reported that there had been a surge in membership applications for membership of the Trust following the Aldershot game and these were being processed. Membership growth is an ever present strategy in bringing together the Herefordshire football community and whilst we have established a really strong base membership we do need to to kick on and grow the membership, particularly give the increasing rate of activity we are currently taking on. The new Prize Bull lottery draw had been well received and over sixty subscriptions had been taken up in just a few days. Help in needed for the Hereford Community to support this fund raising activity through the creation of a distribution network of local shops and stores. The final discussion related to the proposal for the London Bulls to formally affiliate with HUST and this received overwhelming support with the London Bulls having a voice with the HUST board being approved. At the end of the meeting HUST Chairman Chris Williams made a call for support from the working group members and the wider Trust membership. He made a pledge that the work required would be more directed than in the past but that we would only achieve success in our endeavours if we can utilise our membership to the best advantage. Please volunteer your services and tell us what you can do. Your Trust Needs You now. In a poll run by the local paper, only 18% of Wrexham fans want former Bulls loanee Joe Anyinsah to stay at the club next season. The 29 year old started 24 times for the Dragons this term. The FA are investigating the pitch invasion by Lincoln fans during their game with Barnet. A club statement says that Lincolnshire Police have seized footage of the invasion, and that the Imps would ban anyone found guilty. Former Bull Nicky Featherstone is reported to be a target of York City with his Walsall future up in the air. The 25 year old is out of contract at the Bescot after starting just 15 league games this term. Cheltenham have announced that assistant boss Neil Howarth is to leave the club. He has worked with manager Mark Yates for the last five year at both the Robins and Kidderminster. Torquay owner Thea Bristow says she is committed to the club and will support manager Chris Hargreaves in a bid for an immediate return to the Football League. The Gulls were relegated on Saturday and face fellow strugglers Wycombe knowing that if the Chairboys fail to win they will join the Conference also. A second meeting to discuss possible ways of raising funds for Hereford United will be held this evening in the VP Club at the stadium starting at 7.30pm. An initial meeting took place last week chaired by supporter Justin Ratcliffe. This second meeting will follow up on ideas raised last week and, hopefully, explore some new ideas to help keep the club afloat. Former Bulls loanee Paul Green is one of ten players heading for the exit at Forest Green. The former Lincoln midfielder, who had a successful loan spell at Edgar Street this term, is one of eight let go at the end of their deals along with captain Jared Hodgkiss, Ed Asafu-Adjaye, Stephen Brogan, Reece Styche, Saul Williams, Adam McHugh, and Jason Walker. Out of contract pair Yan Klukowski and Jamie Turley have rejected new deals to take offers from Football League sides. The Gumpers have offered striker Matty Taylor a new deal. Members of the London Bulls are to be given a vote on whether to have closer links with HUST, the Hereford United Supporters Trust. Off the pitch, things are moving very quickly at Edgar Street, with the board looking for new investment/owners, and the supporters trust working toward the pledged finances sufficient to make a bid themselves. London Bulls already have an official link with Hereford United as the Supporters Club of London and the South East and we look to maintain that going forward. We are always looking to expand our footprint and the opportunity to do this has presented itself with an offer from the Supporters Trust. HUST have told us that they actively encourage and value input from London Bulls as a group, and they are happy to create a place on the trust board for a liaison officer for the London Bulls. We understand that many London Bulls are already trust members, but there are certain benefits to having a collective voice on the Trust. Not only will information be made available swiftly, but a mechanism for airing our views and feelings directly to the Trust will be in place. A number of London Bulls have advocated that we create an affiliation while retaining our own identity and official status and relationship with the Football Club. We feel that it is in London Bulls', and that of football in Hereford's, best interests to make a decision on this in the very near future. Much will be happening off the field in the coming weeks, a change of ownership is a very real possibility, but unity amongst Bulls supporters and your voice being heard can only be a good thing. We feel it fair and right to canvas you on this matter, and would appreciate your input. Please let us know (by e-mail) by Tuesday evening (30th April) whether you support the proposition to create an additional affiliation with the Trust, on top of our existing relationship with the Club. A majority view will prevail, and we will let you know the result as soon as possible. Hereford United historian Ron Parrott has issued a plea to the board not to sell the club to developers. "Looking to the future I've just got one hope," Parrott told BBC Hereford and Worcester. "That we don't prostitute the club to developers who are interested in coming in and making money out of the club and not helping the club. "If that was the case I'd rather us go under and start again." Meanwhile Martin Watson from HUST has said that pledges to the supporters organisation are well into six figures and have come from fans far and wide. "In some cases I didn't know of them," Watson told BBC Hereford and Worcester. "There are people who have been Hereford fans and moved away for one reason and another but have still retained an afflilation to the club. "They've seen the National Press and the news and decided they want to help out." Finally former player Gareth Davies wants everyone to work together for the good of the club. "It's time now for better joined up working," Davies told H&W. "All the supporters groups, investors, whoever is left from the current board. "The supporters have got to play a major part because it's always been a communal club. "It's not a very big area. Hereford is out on a limb in some terms with football. "Everyone needs to pull together." A final selection of pictures of the Hereford United support at Aldershot on Saturday. Bulls youngster Jarrod Bowen has been attracting the scouts. 'Perhaps key to Hereford's survival both on and off the field is young starlet Jarrod Bowen. Tuesday's fundraising meeting will take place in the VP Club. The meeting starts at 7.30pm. Wednesday's Quiz Night will now take place in Radfords. Free food will also be on offer. The move is so that fans can keep an eye on the youth team game taking place on the same night (kick-off 7.30pm). On Sunday, there is the second annual Don Cooke memorial football match. A Don Cooke select XI will take on the Supporters Team with a few special guests due to appear. Entry is £3 for adults, and £1 for kids. The Conference play-offs will all be televised by BT Sport. Halifax-Cambridge will be screened on Wednesday night, with Grimsby-Gateshead on Thursday. The second legs are both on Sunday with the final a week later. Telford have announced that they will charge £15 adult entry on their return to the Conference after winning Conf North at the first attempt. The Bucks' season tickets will be £315, with u8's free and a £95 ticket for the 16-19 years age group. Chester boss Steve Burr has called on the club to go full time in a bid to regain their Conference status. Burr says the club can make the move on the same budget as they have currently. He is due for talks with club chiefs over his future, with his contract running out after Saturday's games. Forest Green have announced that they will be running on a reduced budget for the coming season. Manager Ady Pennock will not be allowed expensive long term deals by owner Dale Vince with a string of players set to leave. Wrexham boss Kevin Wilkin is reported to be ready to raid former club Nuneaton for striker Louis Moult. The 21 year old scored a final day hat trick, his first goals in nine games, to take his tally for the Conference season to 17. Former Bulls Michael Rose and Sam Winnall were both named in the League Two Team of the Year at last night's PFA awards. Both have helped their sides to promotion this season with ex-Wolves man Winnall netting 23 times for Scunthorpe. Cheltenham keeper Scott Brown says two of his teammates admitted to manager Mark Yates that they weren't trying their best last week. Yates asked the whole squad if they were trying after a string of bad results. Police are investigating a pitch invasion by Lincoln fans near the end of their game with Barnet at the weekend. HUST is pleased to announce that it has secured sufficient pledges from members and the wider community to be able to approach the current Board of Directors regarding a takeover of the club. Whilst we are in a position to open talks, we still require further pledges to ensure we have the best chance of keeping the club going after yesterday's fantastic result. Most of the pledges we have received are on the basis that we can demonstrate that the club can be run on a sound financial footing going forward, and that is our intention. Until we are able to examine the club's books and determine the exact financial position of the club we are not able to provide exact figures to fans but, as soon as it is reasonably possible, we will make the case to the fans - our 'investors' - as to the way forward for our bid. If you have not already done so, you can register your pledge by emailing liaison@hufctrust.co.uk with your details. There are just 6 weeks to the Conference AGM where the club could face sanctions if it has not cleared the outstanding footballing debts. Now is the time to act if you can. With the playing season over, HUST would like to thank those players and off field staff who may be leaving us this summer. While the season may have been disappointing, yesterday's game will live long in the hearts of fans. Peter Beadle, Steve Jenkins and the youth team will have one final bow at Edgar Street this season on Wednesday in the HFA Giantkillers Cup. Please come along if you can. Our new lottery, The Prize Bull, has been very well received. 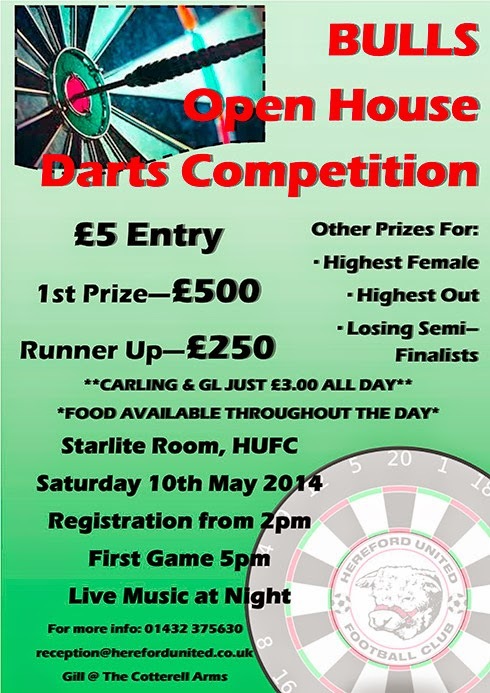 Entries are being accepted online - http://www.hufctrust.co.uk/the-prize-bull/ - with tickets at £1 a week. A "Perm 5" option is also now available to pick 5 numbers with 5 entries of the permutations for £5 a week, paid monthly. The first draw in on Monday, May 26th. Standing order entries are also available, and we are building a network of shops and pubs to sell tickets in due course. Graham Set For Gumpers Return? Bulls captain Luke Graham is reported to have offers on the table from three different clubs. The Stroud News and Journal reports that former club Forest Green is one of a number of clubs to have shown interest. Graham was pushed out of the New Lawn by former boss Dave Hockaday but is now being lined up to replace the Swindon bound defender Jamie Turley according to the paper. Bulls News reported in January that the Gumpers had made an enquiry for Graham, who celebrates his 28th birthday today. A selection of pictures from the first half at Aldershot yesterday. In 2008 as Hereford United fans swarmed on to the pitch at Brentford’s Griffin Park to savour the club’s promotion to League One, little could they have imagined that exactly six short years later they would be invading another pitch a few miles to the South West to celebrate mere survival in the Conference Premier. Such are the ups and downs of football in general and Hereford United in particular. A few years ago I wrote about the agony and ecstasy of being a Hereford United fan but never thought that I would experience the extremes of both emotions in just sixty seconds of one game on a sunny spring evening in Hampshire. What a rollercoaster ride it was. And perhaps there is a certain irony in that the losers on this occasion were Chester. As I recall, it was exactly ten years ago that, despite Hereford’s amazing ten match winning streak at the end of the season, the men from Cheshire pipped them by one point to take the Conference title. Hereford were duly consigned to the play-offs only to lose to of all teams … Aldershot! They say football is a funny old game but in truth not too many Hereford supporters will have been amused by what has been happening at Edgar Street this season. Let’s hope that yesterday’s miracle is the catalyst for something much better in 2014/15. BT sport has some film from both the games at Chester and Aldershot including the celebrations at The Rec. And BBC H&W have put together this 'summary of the action.